Whether you're just listing your home for sale or you've already started entertaining potential buyers, focusing on your "curb appeal" can drastically inc rease your chances of a quick and successful sale. In today's blog post we'll discuss how to stage your front and back yards in order to make them seem more inviting and welcoming to home buyers. Whether you're standing on the street looking at the front of your home or you're on your patio looking out over your back yard, your lawn sets the tone and is one area that potential buyers are sure to focus on. You'll want to ensure that your lawn is very well-kept, with no weeds, dandelions or patches of clover breaking up the continuity of the grass. You'll also want your lawn to be a healthy green, unless you're in an area which has some seasonal turnover or your community has watering restrictions. 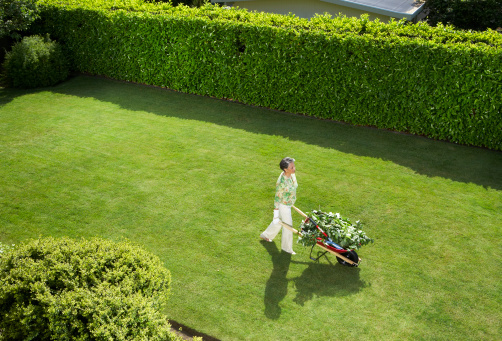 Once the lawn looks incredible, it's time to move on to your gardens and other landscape features. Gardens are the best way to add a vibrant splash of colour to your yard and they can be used to accessorize the front or back of your home to break up the monotony. Choose flowers or plants that are in season for your area to ensure that they are healthy while potential buyers are driving past and viewing the home. Also, keep in mind that most of the time, less is more; don't overdo your gardening or you'll have a small jungle on your hands. Your back yard will be a major selling feature for many different types of home buyer – especially those with children. You'll want to ensure that your back yard feels as inviting as possible. If you have a deck or patio, ensure that you have furniture and your BBQ tastefully arranged so the buyer can picture themselves hosting friends and family. Staging your front and back yards is just one of the many tasks that you'll need to take care of in order to prepare your home for a successful sale.